To help melt the winter blues away a bit, CSN will be giving me an opportunity to review an outdoor water toy. (CSN is a family of online stores that is currently promoting, among other things, a diverse line of kids bedding). 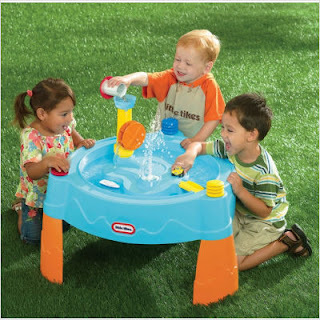 The toy I will be reviewing is a Little Tikes Island Adventure Water Table. It looks like a lot of fun- the sort of thing that might really entice little ones to want to play outdoors. Can't wait to try it out and tell you what I think. 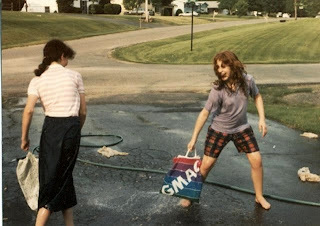 I thought too, that on the day that I write the review for the water table, that it would be fun for all of us to share some of our best outdoor water activities/games/toys. I would love to hear your ideas so we can be ready with an arsenal of fun for when the hot weather hits! I have this table, pretty good, my son LOVES it, but the attachments don't stay on very good. I don't know if it is just my table, or my guy is just rough. Overall excellent table though! *LOVE* our water tabbles. (I have to have two because the boys -6 & 12- always end up fighting over stuff and the toddler doesn't get much room to play). I have an older round one and the Little Tykes double (although I use water in both sides). Cars, shaving cream mountains, food color, ice cubes - all a few of our favorite things to add to the water table play. I tried making a play doh out of coffee grounds but it was not a success.